Housing post-Grenfell and why it wouldn’t have happened in Scotland! 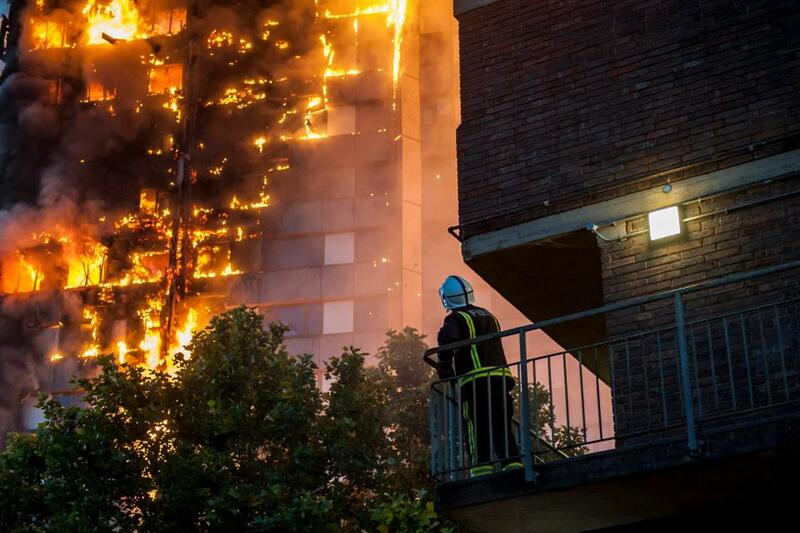 19 days ago the Grenfell Tower fire happened and this disaster has been leading the mainstream news ever since. It represents a seismic change in the provision of what still is wrongly called social housing in the UK. The day after the fire I tweeted that there are so many actors to blame for it such as landlords, councils, central government, builders, fire safety and many others and this is now being stated as systemic failures by many if not all of these, which is true. Here I first choose to look at landlords, the claimed social landlords, and what Grenfell means for them and two obvious changes are apparent. Firstly, these social (sic) landlords have traded for decades on the strategy that only wicked private landlords ignore tenant safety while benevolent social landlords have social purpose coursing through their veins blah, blah blah. That strategy in rented housing terms of public good, private bad no longer holds and whatever trust tenants had in social landlords is gone with the old adage of decades to build a good reputation and five minutes to lose being much at play. Secondly, English housing associations who make up around 63% of all social (sic) landlords have been lobbying the recent Conservative governments for MORE freedoms and LESS regulation that now cannot happen after Grenfell. No government could possibly decide to allow less scrutiny and less regulation of any landlord after the watershed that is Grenfell. I have read dozens of articles over Grenfell and one of the best is by the housing consultant Colin Wiles here which is very considered and informative in its own right but especially for this comment underneath from Derick Tulloch (also in housing) which demonstrates just how PREVENTABLE the Grenfell fire was as it would not have happened in Scotland!! It also explains why no tower block in Scotland is at risk and why ALL 180+ tower blocks tested so far in England have failed the fire safety test. English social tenants have less fire safety than a Scottish social tenant and is there a legal issue here over culpability and corporate manslaughter charges being brought against the landlord? It is not my area of expertise yet there is a hell of a strong lay case given the Scottish regulations and their lack in England. 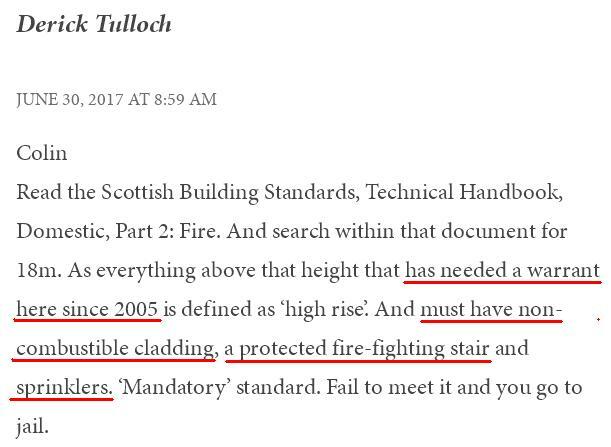 As combustible cladding is outlawed above 18 metre height in Scotland and has been since 2005 how can it be even arguable that it is permitted in England? Questions need to be asked of English housing chief executives as to how they have ignored English social tenants fire safety since at least 2005 and allowed English tenants to be put at risk of fire death by still allowing combustible cladding and still specifying it because it is cheaper! As usual the (English) social tenant has been getting the mushroom syndrome and if it wasn’t bad enough that they have been living in fire death traps because it is cheaper for their social (sic, sic, sic) landlords to clad combustibly, they were also promised “no stone unturned” by Theresa May and now found the Grenfell Inquiry has extremely limited terms of reference that will leave boulders unturned never mind stones!! Correct, in that there is no requirement (yet) up here to retrofit sprinklers to existing blocks. However if the fire stopping and fire containment is done correctly, and the external walls of the buildings are clad in non-combustible cladding – and not in what are basically giant firelighters – then that still results in a safe building. It may be that the Scottish Government’s Short Life Ministerial Working Group will eventually conclude that retrofit of fire suppression systems, such as sprinklers, would be a further safeguard. We shall see. Such works are not without their own risks, as they would involve cutting holes throughout the buildings to fit the pipework. And every single one of those holes would need to be perfectly firestopped. …that the fire-stopping, cladding and maintenance is done properly. Very informative and smoking gun comment you made Derick. Shows how asocial Sassenach ‘social’ landlords truly are!